In today’s world, everyone is seeking the most efficient yet safe way to protect their family and property from the threat of violence and theft. 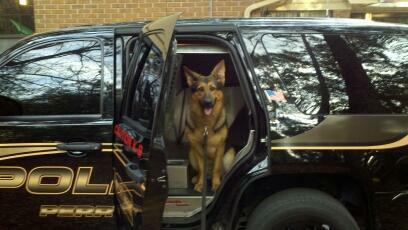 At Sierra Canine we strongly believe the safe solution is a properly trained protection dog. A properly trained protection dog serves many purposes. Firstly, they are your family’s companion and pet. Secondly, they can be the most effective way to protect the things that are most important to you. Here are a few statistics that stress the possible threat that all of us face on a daily basis. These are FBI and United States Department of Justice national statistics. 88% of burglaries are residential in nature. 86% of burglaries occur when people are home. 80% of break-ins occur through a locked door. 38% of assaults & 60% of rapes occur during home invasions. Protection training can be as simple as training your dog to alert you when someone is at your door, window or behind your fenced yard or as complex as training your dog to defend you or someone you love against an individual who poses a real and present threat. I often tell people that a well trained protection dog can be called “back” or “off” if that threat diminishes or disperses, but a bullet can’t! You cannot be sent to prison if your dog attacks an uninvited intruder in your home, but you can in certain circumstances, if you shot an unarmed uninvited intruder in your home! As stated above, there are many different levels of protection training. If you are interested in having your dog protection trained, we first would need to discuss your goals or what level of training that you hope your dog can achieve and then your dog’s temperament and drive would have to be evaluated. Not all dogs are capable of doing higher levels of protection work and realistically, very few pet quality dogs possess the necessary drive and nerve to do any at all. There is a definite difference between true protection dogs and sport protection dogs. I find it quite humorous what several dog training companies here in Northern California are passing off as protection trained dogs when these are merely Schutzhund or other sport protection dogs. Unfortunately, this is common practice in the dog training world. 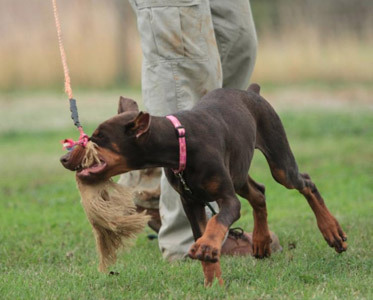 Below you will see sample videos of both, dogs in the early stages of protection training and dogs in the early stages of Schutzhund training. If you have any questions about the difference in the two, please contact us and we would be happy to educate you. This dog has received a high level of foundation training for police service and personal protection work. This scenario demonstrates the dogs ability to enter a building containing extreme environmental obstacles/stressors and engage a passive suspect. You’ll see that the dog enters without hesitation, hitting his target with a full bite and not releasing while engaged with the suspect. The dog maintains excellent control by releasing his grip on the first command and returning to his handler. These are the first couple training sessions with this dog focusing on bicep targeting, and engaging a decoy with a hidden sleeve. This is another video of a dog engaging a suspect who is wearing no visible protective equipment. In this video the dog engages the suspect while wearing a muzzle. He then returns to his handler on command and the muzzle is removed so he can reengage and bite the suspect who has a concealed piece of protective equipment under his sweat shirt. The suspect simulates behavior that a real suspect would exhibit if actually being apprehended. The following video is an example of equipment proofing a police service dog or personal protection dog. The dog is wearing a muzzle and on command engages the suspect. This demonstrates that the dog is willing to engage a plain clothed suspect wearing no visible protection equipment while also maintaining control and returning to the handle on command. I was contacted by a young man a few years ago seeking training for his four month old German Shepherd. During the course of a year or so, I trained this Shepherd and his owner in basic and advanced obedience as well starting the puppy in bite development and taking him all the way to targeting bite locations on a bite suit. This puppy went to be K9 Bruce with Perry Police Dept. in Perry, Fl. I am sharing the story of Jonah because Dennis really saved Jonah’s life. I believe Jonah was up for adoption because at ninety pounds he was a real menace at the end of a leash. I strongly feel that Jonah would have ended up going from home to home or being put-down due to his dog aggressive behavior. So, thank you Dennis for showing us the way! He was not always like this, he was a holy terror! After the first day there was a change in him. It is a life changing experience.